Sweat the onions, garlic, jalapenos and diced tomatoes in a heavy bottom 8qt pot. Use butter or canola oil. Add tomato paste and the remaining spices, seasoning and water. Bring BBQ Sauce to a simmer and cover turn on very low, (nearly off setting) stirring every 15-20 minutes to ensure no scorching occurs. Cook for a minimum of 3 hours. If the sauce looks like it is drying out too much and ½ a cup of water at a time as needed. Using an emulsion stick blender puree the sauce until smooth, but before you do, remove the cinnamon stick. Once smooth, taste! 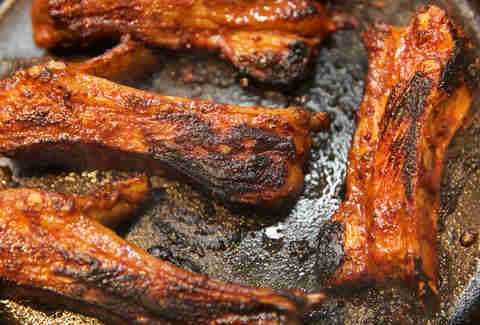 Lamb ribs: Remove any sinew on the outside of the ribs with a sharp knife. 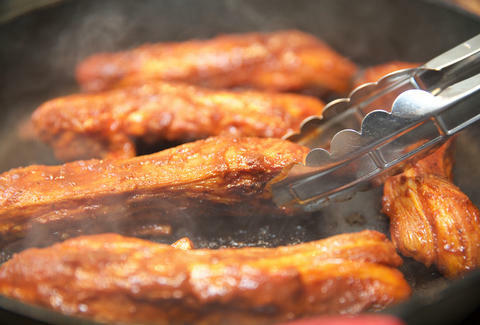 Marinate the ribs in the finished BBQ Sauce for 1 hour at room temperature. After marinating, cook over the open flame in a ripping hot, minimally oiled cast-iron pan for 5-6 minutes on each side (4 on each side if you’re using a lid). 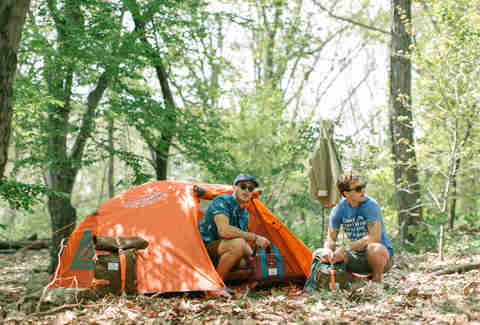 While you can impress your friends with classy and complex campfire fare, no one wants to wait for you to find a flat surface to chop herbs on, or mix a marinade. “Do as much as you can at home -- seasoning your meat at home, wrapping it in tinfoil, having it ready to go. Simple sides are great.” Like… a baked potato prepped with oil, salt, pepper, wrapped in foil and thrown in the fire. Cut the parchment paper into a large square. Drizzle a little olive oil in the middle and place the fish on top. Season with the fish rub, then add the veggies and peppers. 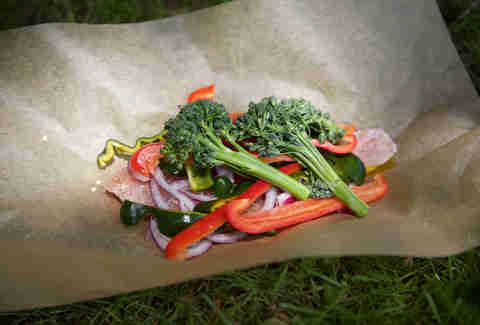 Season the veggies and pepper with the fish rub and fold the paper around all to form a tight pouch. Place the pouch in a sauté pan with some oil and cook for approximately 15 to 20 minutes, depending on the size of the fire. 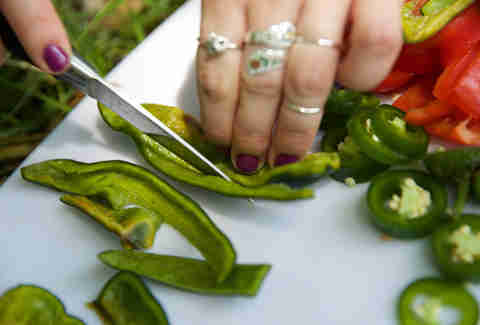 Do this with the lid closed to circulate the grill smoke and flavor and to create an oven-type environment. Once cooked, mix the mint and salt and serve it as a garnish along with some lime wedges. Pro tips: Use a low fire and a metal sheet to block wind. Measure ingredients ahead of time and put them in plastic bags. 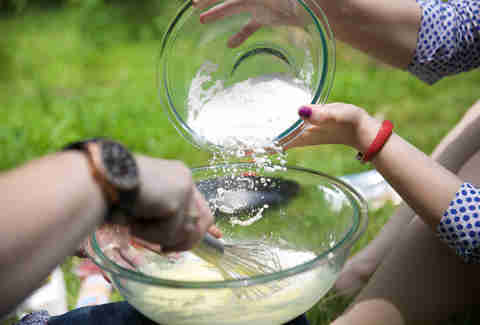 In a small bowl, whisk together flour, baking powder, baking soda and salt in a small bowl. Set aside. Beat butter and sugar until fluffy, using a whisk. Add the egg and combine. Slowly add the flour, then some buttermilk and then, more flour. Scrape the batter into a cast-iron pan that has been sprayed with baking spray. 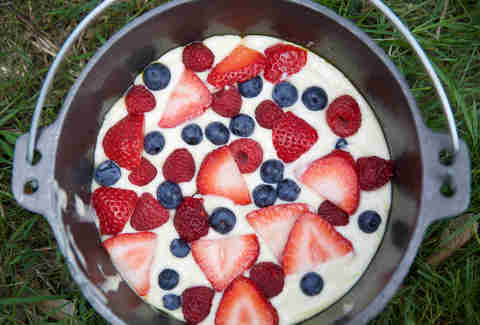 Spread the batter to the edges and then dot the top with berries. In another bowl, mix together the topping ingredients. In a small bowl, whip heavy cream and sugar. If you desire more berries over the top, warm a sauté pan on the fire, add two teaspoons of sugar, and place one and a half cups of assorted berries in with the sugar and gently warm. The berries will release water and become soft and tender. As a loyal reader, your opinion is more important to us than oxygen, or hydrogen even. Please take this quick survey and tell us what you think!